Augmented reality is a type of technology that combines virtual images with the real world. As of now, there are several main competitors on the market including Google Glass by Google, the HoloLens by Microsoft, and Head Mounted Displays (HMD). Currently, AR technology is facing problems supporting wide-angle images. While high-angle lenses are preferred when creating AR technology, they are not practical due to their large weight and volume. To solve this issue, Professor Lee and his team developed a new lens using a “metasurface” with a thickness of just 100 nanometers (10-9 of a meter). The metasurface is a two-dimensional structure that consists of a pattern of nanostructures smaller than the wavelength of light and has been gaining more attention in the scientific community for exhibiting several optical characteristics not existent in nature. Due to its thin and light structure at 100 nanometers wide, the metalens is suitable for use in HMDs. Until now, attempts at developing such a lens have been difficult: scientists have only been able to create lenses with a diameter smaller than 1mm, making it nearly impossible to implement in real life. 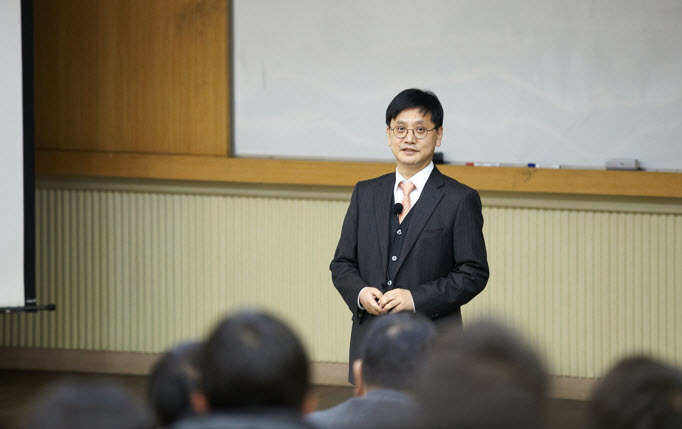 Professor Lee’s team, however, was able to make its lens 2cm in diameter, the perfect candidate for AR devices. If the metalens is used in future AR glasses, the viewing angles of such devices will be dramatically increased. These lenses can also be used in microscopes with similar effects. Theoretically, the metalens can achieve an augmented reality viewing angle of more than 100°; a 90° visual angle has already been verified experimentally. Considering the fact that existing augmented reality glasses only have a viewing angle of about 25°, the metalens is expected to give users a much greater sense of immersion as they can secure a field of view of more than 10 times wider than before. The research was funded by the Ministry of Science and Technology and Information Communication and supported by the National Research Foundation of Korea`s Basic Research Program and the Global Frontier Task Force. The research results were published in the journal Nature Communications on November 1.